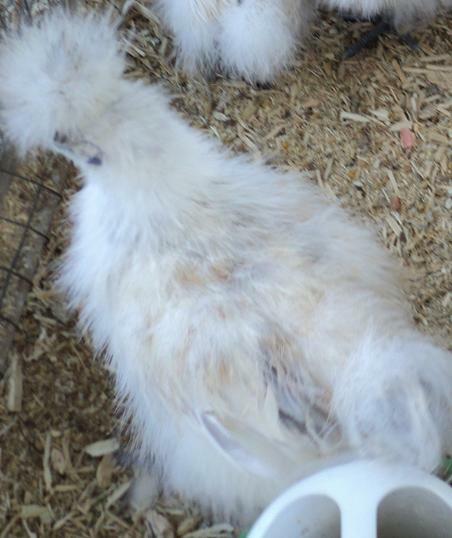 The silkie is classified as a light breed soft feather bird, with a tinted to cream egg. They are described in terms of their male and female characteristics. The bird is to be neat, lively and showy in appearance. The body should be broad and stout, while the back is short. The saddle should be silky and rising towards the tail. The rear end should be broad and generously covered with fine fluff, while the saddle hackles should be soft, abundant and flowing. The chest should be wide and full, with square stout shoulders which are well covered with the neck hackle. The wings should be soft and fluffy at the shoulders while the ends of the wings should be “osprey plumaged”, which means they are very soft and hanging loosely downwards. The tail should be short and very ragged, with minimal numbers of hard feathers. The tail should have a short round curve. The head should be short and neat, with a soft full crest, with half a dozen to a dozen soft silky feathers streaming from the back. The crest should not show any hard feathers. The comb should be almost circular in shape, broader than high, with a number of small prominences over it, and a narrow furrow traversing the middle of the comb. Eyes should be bright and black, and not too prominent, while the beak should be short and stout at the base. The face should be smooth, with concave, nearly semi-circular wattles. In the non-bearded variety the earlobes should be oval rather than round, while in the bearded variety the earlobes are very small, almost hidden by the beard. Also in the bearded variety the beard and muff is made of feathers that point horizontally backwards, from both sides of the beak while the centre feathers point vertically downwards. The three sets of feathers give a muffling effect. The neck should be short to medium in length meeting the body broadly with an abundant, flowing hackle. The legs and feet should be free of scaliness. Short legs covered with plenty of fluff while the thighs should be wide apart. The hock feathers should be soft and thick. There should be a moderate quantity of feathers on the legs. There should be five toes, the middle and outer toes should be feathered, but these feathers should not be hard. The feathers over the body should be silky and fluffy with a profusion of hair like feathers. The saddle should be broad and well cushioned, covered in silky plumage which should nearly obscure the tail, cochiny in appearance. The legs are quite short in the female, with the underfluff and thigh fluff nearly meeting the ground. The crest should be short and neat, with no hard feather, and not split by the comb. It should resemble a powder puff. The eye should not be hidden by the crest when viewed from the side. The comb should be small, and the earlobes small and roundish. Wattles are either non-existent or small and oval in shape. Other characteristics are similar to male allowing for natural sexual differences. All varieties: Beak slate blue. Eyes black. Comb, face and wattles: Mulberry. Earlobes: turquoise (preferred) or mulberry. Shanks and feet: Leaden. Nails—blue-white. Skin—mulberry. Green beaks or green tip to beak. Horns protruding from the comb. Eye colour OTHER THAN BLACK. Not silky plumage (ie hard feathers). Eyesight obscured by crest when viewed from side at eye level.